Over the course of the past few months, we have featured two classes of metals and minerals, which we believe deserve more attention than they are currently being awarded. Expanding on the findings of our 2012 “Gateway Metals and the Foundations of American Technology” report, in which we focused on a group of five “Gateway” metals which “unlock” a series of “Co-Products” – tech metals increasingly indispensable to innovation and development. In spite of the fact that the five Gateway Metals Aluminum, Copper, Nickel, Tin and Zinc and their Co-Products are growing in significance, stakeholders in academia, policy making and industry have been slow to take note of the correlation between them. One notable exception is a study by N.T. Nassar, T.E. Graedel, and E.M. Harper, published in Science Advances in April of 2015. 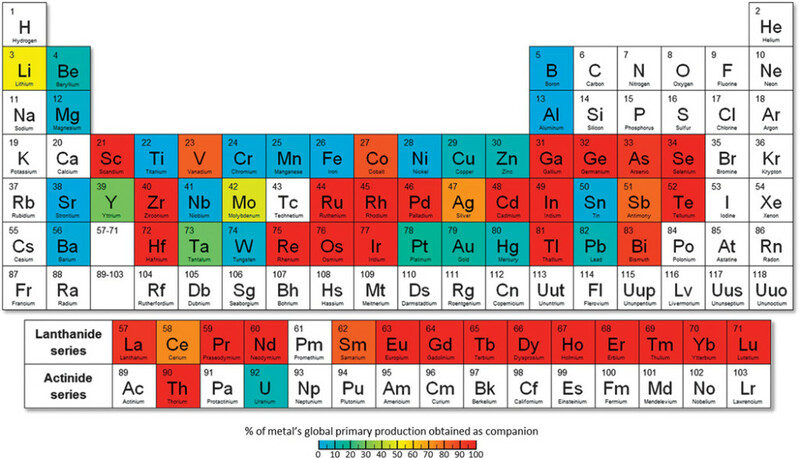 The authors of “By-product metals are technologically essential but have problematic supply” cast their net a bit wider using a somewhat more scholarly approach and different terminology to describe “Gateway Metals” and “Co-Products” – they refer to them as “Host Metals” and “By-Product” or “Companion Metals.” Nomenclature aside, their findings and conclusions are similar to the ones we have drawn.